Leviathan plans to combat and ward off bed bugs at a hotel near you. The vile and diabolical H.R. 6068 a.k.a. Don't Let The Bed Bugs Bite Act of 2008 is a government boondoggle constructed to prop up a welfare program to "assist States in inspecting hotel rooms for bed bugs." And guess what how much taxpayers will be forced to shell out to pay for this pork? They'll be arm twisted to pay for it at a tune of -- get this!! -- $50,000,000. To establish a grant program to assist States in inspecting hotel rooms for bed bugs. This Act may be cited as the `Don't Let the Bed Bugs Bite Act of 2008'. (7) bed bugs possess all of the necessary prerequisites for being capable of passing diseases from one host to another. SEC. 3. BED BUG INSPECTION GRANT PROGRAM. (a) Administration; Amount- The Secretary of Commerce, in cooperation with the Travel and Tourism Advisory Board, may provide grants to an eligible State to assist such State in carrying out the inspections described in subsection (c). The grants shall be in amounts determined by the Secretary, taking into consideration the relative needs of the State. (b) Eligibility- A State is eligible for a grant under this Act if the State has established a program whereby not fewer than 20 percent of rooms in lodging facilities in such State are inspected annually for cimex lectularius, commonly know as the bed bug. The Federal share of funding for such a program shall not exceed 80 percent. (3) educate the proprietors and staff of lodging establishments about methods to prevent and eradicate cimex lectularius. (d) Application- To receive a grant under this Act, an eligible State shall submit an application to the Secretary of Commerce in such form and containing such information as the Secretary shall determine. (e) Definition of Lodging Facility- For purposes of this Act and the requirement under subsection (b) for State programs receiving funding under this Act, the term `lodging facility' means any individual hotel, motel, or inn that makes available for commercial lodging more than 10 individual rooms. (f) Authorization of Appropriations- There is authorized to be appropriated $50,000,000 for each of fiscal years 2009 through 2012 to the Secretary of Commerce for the grants authorized under this Act. SEC. 4. REPORT TO CONGRESS. The Secretary of Commerce shall transmit a report to Congress not later than 3 years after the issuance of the first grant authorized under this Act, which shall contain an assessment of the effectiveness of the grant program. 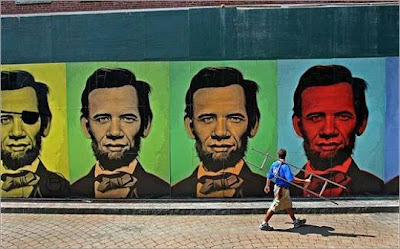 Apparently, a street artist from Boston completed his grand creation -- a mural that melds the faces of Abraham Lincoln and Barack Obama together in a rainbow of colors, although they are "multiple composite portraits." Unfortunately, by doing so, it ignited a ruckus with the city residents who feel the artist's ad blitz was unauthorized, considering it has covered the entire city. 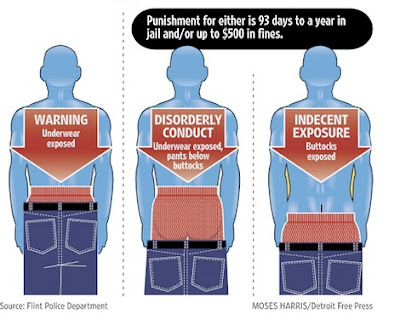 Flint Cops to Teens: "Pull Up Pants or Face Either Fines or Jail Time"
Andrew Sullivan on the Flint, Michigan police department's vile and diabolical crackdown on baggy pants. On Tuesday, July 8, 2008, on Eric Dondero Rittberg's Libertarian Republican blog, Dondero portrayed me as a loopy, out-of-control critic who needed to be put on a political leash after I lambasted his presidential candidate for not only extending his condolences to the family of the late white supremacist Senator Jesse Helms but also praising the late senator by saying that Helms "was one of the finest, most courageous and deeply principled men to ever serve in the United States Congress." Not only that, he urged his loyal supporters, party loyalists, and all Americans to "stop and give thanks to God for the life and work of Jesse Helms." As President’s Reagan’s right hand and ally, he helped bring down Communism so that nations might grow and flourish in freedom. He was a stalwart ally of freedom fighters around the globe, knowing that we are all diminished if we allow fascism to flourish. He was also the consummate gentleman, revered by colleagues, staff and friends for his unfailing kindness, good humor, generosity and patriotism. No matter how you spin it, you cannot deny the fact that Barr has now officially made himself to be a racist sympathizer. If he had sent out a press release saying that he was merely giving his condolences to the Helms family and ended it there, I wouldn't have had a problem with that. But it didn't happen that way. Barr went much further, urging Americans, fellow campaign supporters and party loyalists to thank a racist politician who, among other things, supported racist policies like the Jim Crow laws of the South and looked at African Americans as though they were subhuman creatures who didn't deserve to be treated equally under the law, let alone be deserving of individual rights at all. It was repugnant, evil, and diabolical. Yeah, Badnarik’s campaign really set the standard for future campaigns, eh? Go jump off a cliff for a change, Trosper. Your candidate — the guy you’ve been cheerleading for a while since the Denver convention — is a racist sympathizer and a supporter of racism. He praised a senator who should NEVER be praised. In fact, he should be damned for the evils he brought into this world. This isn’t about Michael Badnarik and his 2004 campaign. That campaign, yes, was a joke, but only because collectivists and GOP shills invaded and infested that campaign. But it’s a moot matter, because that was 4 years ago. We’re talking about Barr and his praising of a white supremacist senator who went from being a Democrat to a Republican and was a racist. Helms was a Republican. He was a conservative. Conservatives are vile, evil, and repugnant. He should be damned, and his grave should be spit upon. It’s a damn good thing this man is dead, because he’s a vile turd who deserves to burn in hell. Bob Barr, who has the temerity to praise this man, should drop out of the LP and save the Party any future embarrassment. He will be doing you guys, the Party, his campaign supporters, and himself a huge favor. Look around you, Gene. The LP is dying. The Barr/Root campaign ain’t getting the coverage that you guys claimed he would. Except for his joke-of-an-appearance on Glenn Beck and several Fox News shows, he’s gotten little to no coverage nationwide. And his campaign promise of $40 million? Puh-leeze! He’s only accumulated over $330,000 in donations, the most he’ll probably get is $350,000, maybe a little more than that. Any one who supports a presidential candidate who supports a racist is a moron, not to mention a racist scumbag, and should be treated as such. What I wrote was essentially true. Helms was a Democrat who switched to the Republican aisle but his racist views never changed. He was a racist. 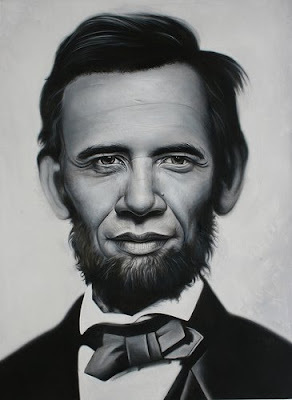 He supported racist policies. None of his policies, while he was in office, were very George Wallacesque. The images of the Ku Klux Klan saying that "Negros" have no rights and that the "coloreds" must use separate bathrooms are just appalling and disgusting. Government-sanctioned and government-sponsored racism, including the kind of racism that we saw during the Jim Crow era (and Helms was a big sponsor of those laws). Helm's "unfailing kindness" was never extended to African-Americans of that period, and I, as a free marketeer, will NEVER, EVER support a Libertarian politician who speaks warmly of a bigoted, racist politician who once penned an ad for a racist Democratic candidate that said: "White people, wake up before it is too late. Do you want Negroes working beside you, your wife and your daughters, in your mills and factories? Frank Graham favors mingling of the races." Of course, this is also the same Jesse Helms, who worked for an unsuccessful Democratic primary gubernatorial campaign of I. Beverly Lake, Sr. Lake himself was a staunch supporter of racial segregation -- a clear-cut indication that he supported government-mandated, government-imposed racist policies that espoused hatred and contempt for blacks in the South. Todd Andrew Barnett (photo) serves as the National Vice-Chairman of the Boston Tea Party. Barnett is a 30s something, sometimes employed, self-proclaimed "Bi-Sexual Radical" living with his parents in a southeast Michigan Detroit suburb. He also has a sporadically produced internet radio show called "Liberty Cap Radio." 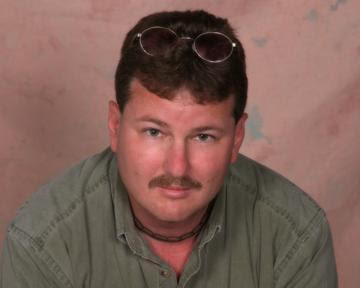 The BTP is a creation of Anarchist Libertarian Tom Knapp. The Party had been defunct for over a year, but was recently revitalized in reaction to "Republican" Bob Barr winning the Libertarian nomination. Look around you... The LP is dying. The Barr/Root campaign ain’t getting the coverage that you guys claimed he would. Except for his joke-of-an-appearance on Glenn Beck and several Fox News shows, he’s gotten little to no coverage nationwide. And his campaign promise of $40 million? Puh-leeze! He’s only accumulated over $330,000 in donations, the most he’ll probably get is $350,000, maybe a little more than that. This was written two days after Bob Barr appeared on ABC News with George Stephanopholous, and CNN with Rick Sanchez. Barnett appears to be completely unaware of those media appearances. By some informal estimates now, Bob Barr has received more publicity than all other past Libertarian Presidential candidates combined. Within the last couple weeks, articles on Barr have appeared in the NY Times, LA Times, WSJ, Washington Post, Washington Times, and numerous other periodicals across the Nation. Just today, Wonkette has a major story on Barr, as does the NY Observer. The $330,000 fundraising figure Barnett cites is also a bit dated. Sources indicate that Barr's fundraising is now nearing the $500,000 level with 4 months still left in the campaign. Barnett further asserts, that the "LP is dying" as a result of the Barr campaign. Recent indications are that the Libertarian Party will achieve 49 state ballot (possiblility still of all 50), 5 states more than 2004, and second only to the 1980, and 2000 campaigns which gained all 50 states. Barnett may be entitled to his views on Barr as an alleged "racist" and "conservative," but he should get his facts straight before ranting about the LP Presidential candidate. After all, shouldn't we expect more from the "National Vice-Chairman of the Boston Tea Party." Dondero is a hothead, and he certainly loves to spin his lies to make himself out to be the victim. He uses the same technique for Bob Barr. In his pathetic defense of his candidate, he goes out of his way to say that what I wrote is b.s. He says that I "should get [my] facts straight before ranting about the LP Presidential candidate." 1.) Eric should know that I back everything I say. And, even if I don't back everything I say, everything that's posted on IPR and LFV's websites speaks for itself. That goes without saying. 2.) Eric starts out his rant with mentioning that I am in my '30s, that I live in a "southeast Michigan Detroit suburb". He also has the gall to mention my parents, which I find offensive, considering that this has nothing to do with them. So I do wish that he would leave them out of it. And as for my employment status and sexual preference, all of that is none of his business. He has no business posting that on his blog, let alone any references to my family. If he has a gripe with me, fine. He needs to leave my family members out of it and focus his hatred of me towards me. 3.) 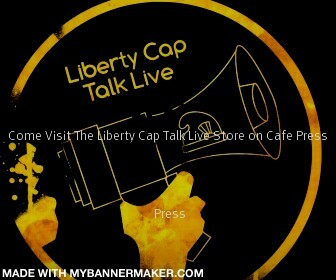 My online internet show is called Liberty Cap Talk Live, not "Liberty Cap Radio." (For someone who is a self-professed English instructor, you would think he would proofread his own blog, but apparently he doesn't.) If you want to mention my show, please get the title right. 4.) Dondero says that my citing of Barr's donation figure (which I used as "over $330,000") was "a bit dated." I may have been off on the actual amount, but I was generally correct. But, even if I had been off on the figure a bit, so what? Barr's fundraising practices and records are hardly impressive. Even if his donations top over $400,000 or even $500,000, it won't even reach the neighborhood of $40 million (which the Barr campaign promised its supporters that it would raise). Plus, with the economy on the downswing, why would anyone want to donate money to that campaign? People can't afford to make any political donations of that magnitude, given the state of the U.S. economy. Who are Dondero, Barr, and their sycophants kidding? 5.) Dondero claims that the Barr campaign will be on the ballot in 49 states. Hardly. Although the goal was to get the campaign on the ballot in 38 states, it actually will find itself on the ballot in 30 states, without any further possibility that it will be anything more than that. Dondero's claim of "49 states" should be treated with a grain of salt. Moreover, my statement that "the LP is dying" is true. Membership, as LP founder David Nolan recently stated, is down 20 percent from 2004 and 30 percent from 2000. At the rate it's going, membership will continue to decline, even if a few new people join the party. But, even if new people do join the LP as "members," it will hardly offset the significant decline in the Party membership. 6.) Finally, Dondero claims that I didn't take into account Barr's TV appearance with George Stephanopholous and CNN's Rick Sanchez and the newpaper media mentioning him (like the New York Times, Washington Post, etc.). Actually, I did take all of that into account. So what if Barr made those appearances? Media exposure may be helping his campaign a lot. But that's NOT lots of media coverage. That's some media coverage, but he's not getting the kind of coverage that Ron Paul got throughout his presidential campaign. The difference is between Barr and Paul is that Paul deserved the coverage because people were coming to him, whereas Barr has been trying to get the media's attention. Paul was doing things newsworthy, whereas Barr hasn't. Furthermore, Ron generated the firestorm for his campaign through college kids and the Meet-up groups, something that Barr hasn't been able to achieve. Barr just doesn't emit the kind of interest and passion for his campaign as Paul did for his. Plus, Ron Paul was FAR more libertarian on the issues, and he was consistently against the war and kept pounding on the foreign policy of non-intervention issue, whereas Barr is a selective interventionist at the global level. Ron opposed the War on Drugs, whereas Barr doesn't. Even Ron spoke out against the government's persecution of people who used marijuana for medicinal purposes, although Barr's record on marijuana, while appearing to have improved, is very mixed and inconsistent. How is Barr any better than Ron or any other candidate? And, and can I say that Ron's campaign generated the level of interest that Ronald Reagan never did? You can't say the same for Barr. With the recent departure of Chris Bennett from the LP and the LNC's despicable actions toward Angela Keaton, it's pretty clear that the LP will not survive at all at the closing of the 2008 election season. The chance of any survival is terribly remote. With the platform obliterated and the LP becoming more Republican-lite every day and no longer rooted in its libertarian foundations, should we really be surprised? My answer would be a firm "no." This is why the Boston Tea Party is succeeding where the LP failed. This is why Charles Jay is a better candidate than Bob Barr. This is the reason why the BTP will pick up where the LP left off and will continue to do so for posterity. As for Dondero? He's a Republican shill who has no business using the label "libertarian" to further his partisan interests at the expense of human liberty which was once the bedrock of this nation. As a traitor to liberty, Dondero will pay a huge price for it, and that price will come sooner than he thinks. Whatever form it will take, I'm not certain. But what is certain....is that I want nothing to do with the likes of him...or anyone like him. And I think that my sanity will be better for it. As far as I'm concerned, Eric Dondero is wrong about me, Bob Barr, and Jesse Helms. He's neither qualified nor worthy of respect and trust to make these statements about me, his racist sympathizing presidential candidate, and racist Senator Jesse Helms.